Oh how I love your law! It is my meditation all the day (Ps. 119:97). Have you ever been in a conversation in which the other person wouldn’t stop talking? It’s not very enjoyable. You want to speak, but you never get a chance! Prayer is talking to God. But God doesn’t want us to do all the talking. He wants to speak to us. And how does God speak to us? Through the Bible (also know as the word of God). Many Christians struggle to take the time to pray. Maybe we don’t take the time to pray because we underestimate the importance of prayer. We will usually make time for things that are important to us. We believe that food is essential, and we make time for it everyday. If we believe that prayer is essential to the Christina life, we must make time for it. Maybe we have good intentions to take time to pray, but we never end up doing much praying. We are like the disciples Peter, James, and John. Jesus said to them, ““Watch and pray that you may not enter into temptation. The spirit is indeed willing, but the flesh is weak” (Matthew 26:41). It’s probably a good idea to designate a quiet time and place. Jesus often withdrew to “desolate places” to pray (Luke 5:16). 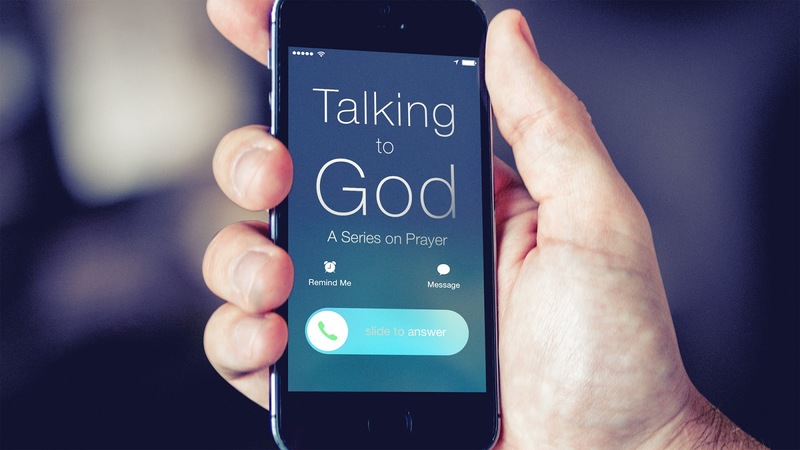 Before we speak to God, God wants to speak to us. God speaks to us when we read and meditate on his word. Meditate? J. I. Packer writes, “We have some idea, perhaps, what prayer is, but what is meditation? Well may we ask, for meditation is a lost art today, and Christian people suffer grievously from their ignorance of the practice. Meditation is the activity of calling to mind, and thinking over, and dwelling on, and applying to oneself, the various things that one knows about the works and ways and purposes and promises of God.”  A mind meditating on God’s word is like a sponge absorbing water. Eastern meditation is an attempt to empty the mind. Christian meditation is an attempt to fill the mind. With what do we fill our minds? God’s word. Several times in Scripture we are urged to mediate upon God’s word. “This Book of the Law shall not depart from your mouth, but you shall meditate on it day and night” (Josh. 1:8). “But his delight is in the law of the LORD, and on his law he meditates day and night” (Ps. 1:2). “O how I love your law! It is my meditation all the day” (Ps. 119:97). “My eyes are awake before the watches of the night, that I may meditate on your promise” (Ps. 119:148). “I remember the days of old; I meditate on all that you have done; I ponder the work of your hands” (Ps. 143:5). Busyness and distractions are the enemies of meditating on God’s word. Stillness and solitude are the friends of meditating on God’s word. The need for mediating on God’s word is illustrated in the story of Mary and Martha (Luke 10:38-42). Mary “sat at the Lord’s feet and listened to his teaching” (v. 39), but Martha “was distracted with much serving” (v. 40). Jesus said, “Martha, Martha, you are anxious and troubled about many things, but one thing is necessary. Mary has chosen the good portion, which will not be taken away from her” (vv. 41-42). Read a Scripture passage. Pick one or two truths you find in the passage. Choose the one that most impresses you and write it in a sentence. Now ask: How does this truth help me praise God? How does it show me a sin to confess? How does it show me something to ask for? Now turn the answers to the three questions into a prayer—adoration, petition, and suppli-cation. This plan only takes about 15 minutes. (Of course, that makes it sound easier than it actually is.) But taking time to meditate upon God word and pray will make a huge difference in our lives. D. A Carson, A Call to Spiritual Reformation, 114. J. I. Packer, Knowing God. This plan is taken from Tim Keller’s book Prayer: Experiencing Awe and Intimacy with God (254-255).